The outlook for the machinery industry is promising, as the Italian economy is expected to grow 0.6% in 2015 and 0.9% in 2016 after two years of contraction. After just a modest increase in 2013, Italian machinery production gained momentum in 2014, growing 4.6% year-on-year, according to the Italian machinery association UCIMU. While the export-oriented Italian machinery sector was negatively affected by slower global growth and the decision of the European Union to limit exports of machinery to Russia (one of Italy´s largest machinery buyers), the industry benefited from the rebound of the Italian economy in 2014. Due to renewed investments made by the domestic manufacturing industry in production systems, domestic sales recorded even double-digit rates. This was also helped by the fact that Italian machinery manufacturers were able to swiftly re-orientate a part of their supply offering to the new demand situation. While export orders levelled off, export sales increased 2% in Q1 of 2015. In the same period the rebound of domestic demand continued, with orders increasing by more than 15% year-onyear. The outlook for the coming months is promising, as the Italian economy is expected to grow 0.6% in 2015 and 0.9% in 2016 after two years of contraction, and real fixed investment is forecast to increase 1.5% after more than five years of decline. 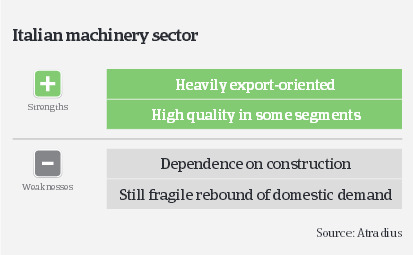 While the Italian construction sector as a main buyer of machinery still shows a feeble performance, machinery strongly benefits from increased orders from automotive companies, as this sector has rebounded since 2014. Both the amount and volume of non-payments that we recorded in 2014 were low compared to other sectors. In the first half of 2015 we even recorded a decrease for both amount and volume of non-payments. The number of insolvencies in the machinery sector is relatively low, and we expect no change in the coming months. Regarding payment defaults the machinery sector is performing better than Italian manufacturing as a whole. However, payment duration in the machinery industry is 120 days on average. Our underwriting approach in 2015 remains generally open, however, the recent surge in domestic demand for machinery cannot hide the fact that the on-going economic recovery in Italy remains fragile. We are more relaxed for some niche export-focused subsectors (e.g. high precision mechanical works), which is one of Italy’s production success stories. 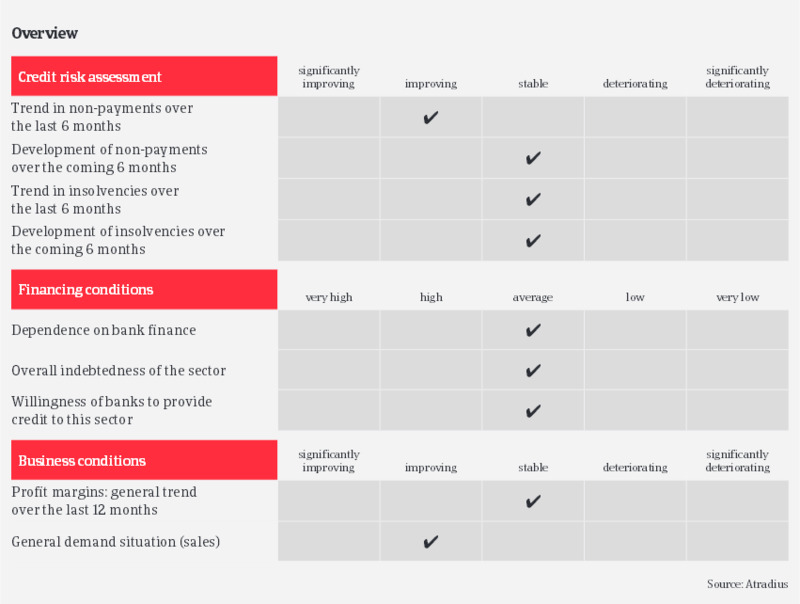 Those businesses usually show solid financials, a good liquidity profile and an increase in their order portfolios amply covered by advanced payments. Our underwriting approach is also more open for subsidiaries of solid international groups that have consolidated their position in Italy. However, we are more cautious about companies operating in still difficult end-sectors (especially construction), and smaller businesses mainly in the textile and printing machinery subsectors, as those are facing strong competition from Asia for lower value-added machinery products. Payments in the Italian automotive industry range between 60-90 to 120-150 days, depending on the end-buyer and whether working capital requirements can be obtained from banks or suppliers.